We are United Methodists working to create space at the table for all of God's people, including lesbian, gay, bisexual, transgender and queer people. Per new rules this year, all ministries are limited to one table in the Exhibition Hall. Look for our table to find information and resources about Reconciling Ministries. A small group of witnesses will wear all-black (or dark) clothing and rainbow stoles (click here for info on the stoles) and sit on the side(s) of the auditorium. During the three times that the ordinands are blessed, the witnesses stand silently for the duration of the blessing. All respectful participants are welcome to join in this witness. 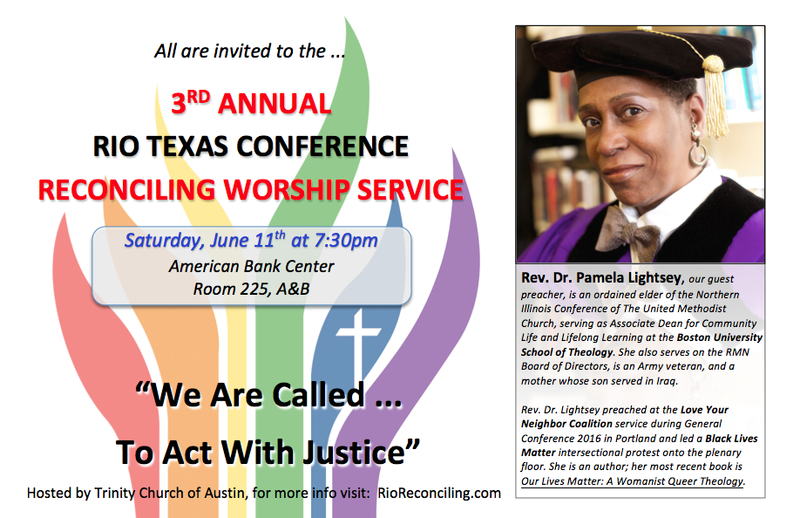 The Rio Texas Reconciling Team developed this witness in 2014, repeated it in 2015, and plans to do so again in 2016, in support of M Barclay (click here), and other ordinands who have not been treated fairly, because of their perceived sexual orientation or gender identity, by our conference Board of Ordained Ministry. We also wish to honor the memory of Gene Leggett (click here and here) who held a witness during the Southwest Texas (as part of the Rio Texas conference was formerly named) Annual Conference ordination service for many years after being stripped of his ordination. The Rio Texas Reconciling Team ordination service witness is designed to provide a safe and respectful means for those who wish to call attention to a unjust situation. We plan to repeat this witness every year in memory of those who cannot be ordained due to their sexual orientation or gender identity.